An explanation: As you probably know, we do not know if our coming attraction is a boy or a girl. So, we’re going for a gender-neutral theme in le chambre de bebe (we’re also trying to learn French). 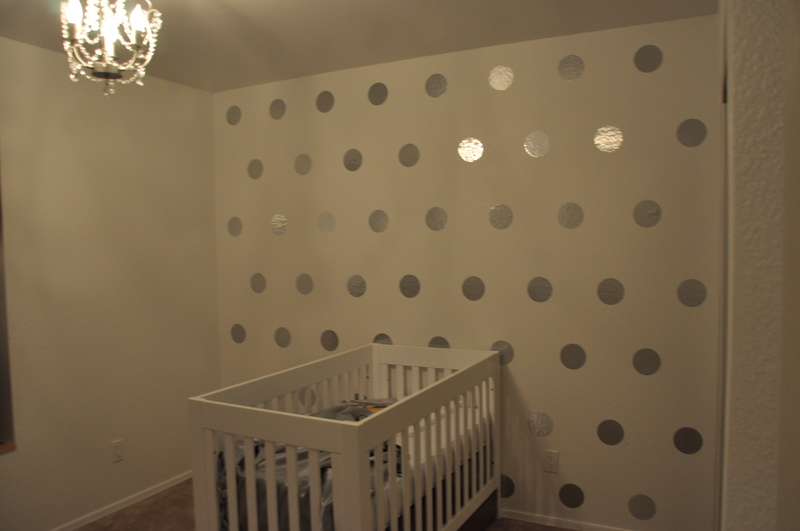 Also, we plan on having two kiddos – and using this nursery for both. Since we (obviously) have no way of predicting the gender of mini-dreamer #2 – that’s also reason to keep the space a relatively pink-and-blue-free-zone. 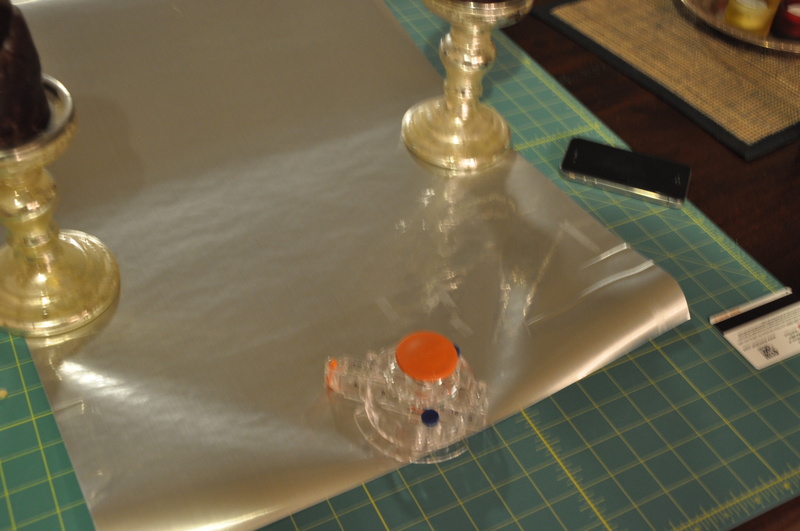 So, we’re going with a silver and white theme. Not really sure where that idea originated, although it probably had something to do with a chandelier that Mrs. Dreamer purchased for another room, decided against using it there (can’t remember where now – she’s a bit chandelier-obsessed), but held onto it because it would clearly be cute in a nursery. 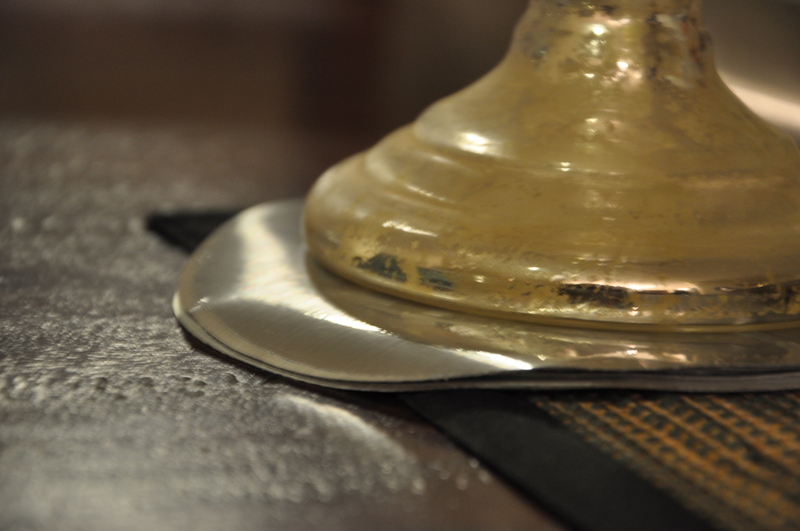 It is silver and crystal – you can see it in the above photo. 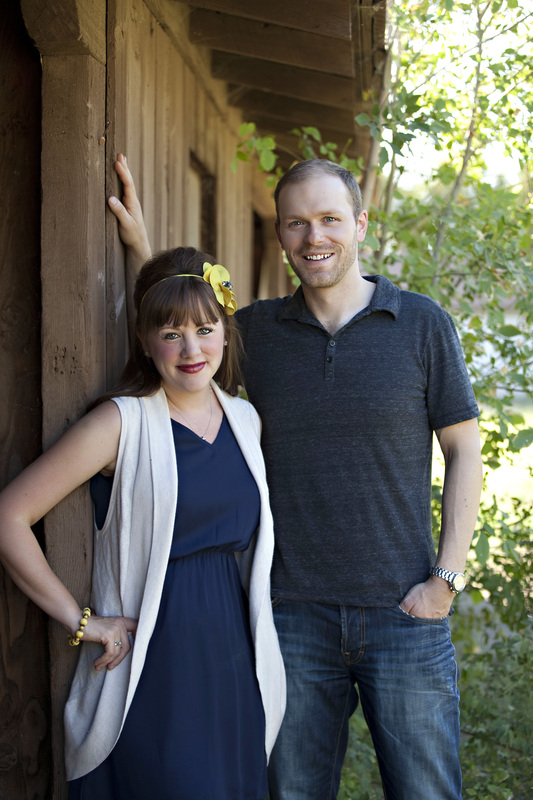 Also, our wedding colors were silver, white and blue – hmm… perhaps we’re just stuck on that theme. Anywho, it is coming together really nicely. We’re hoping to show you the complete project in just a few, short weeks. 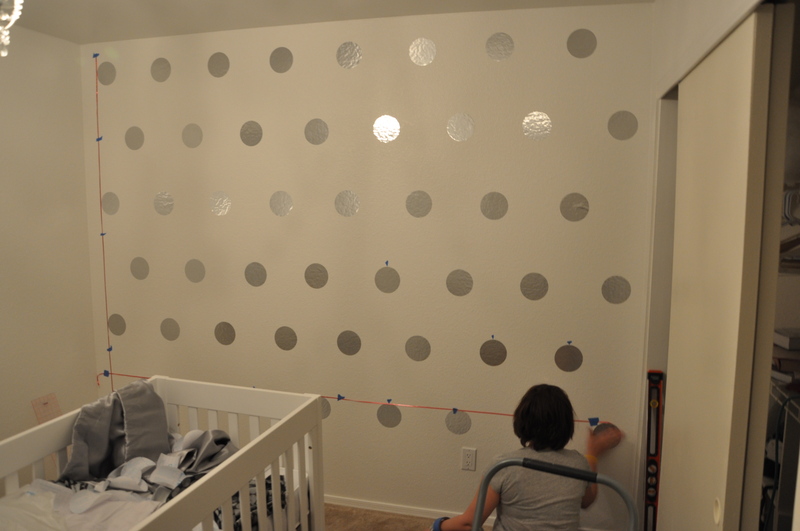 We wanted to do at least one wall of silver polka-dots. First thought: wallpaper. However, the Dream came with textured walls (blech) and that makes wallpaper no bueno. 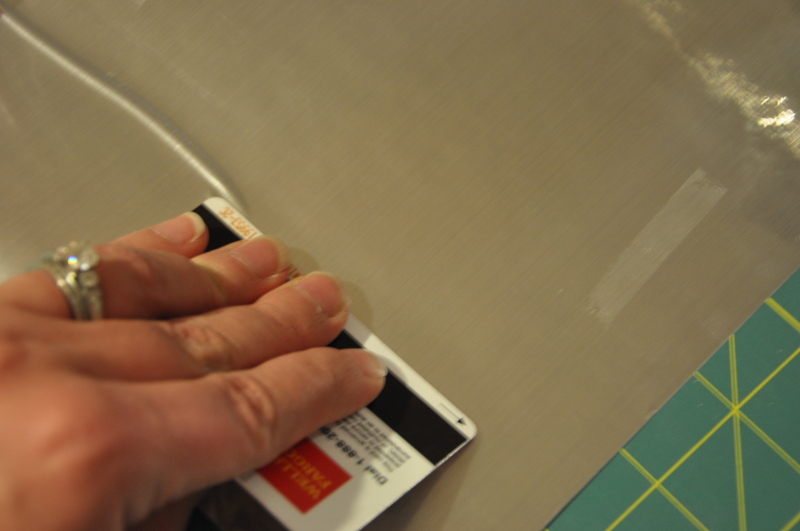 Second thought, painting on silver dots with spray paint or metallic paint. However, the Dream came with textured walls (blech) and that makes painting something that precise no bueno. Third thought (now we’re getting closer), wall decals. 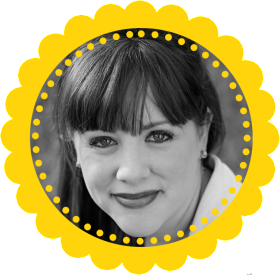 However, before we knew what that would entail – we needed to know how many we would need. 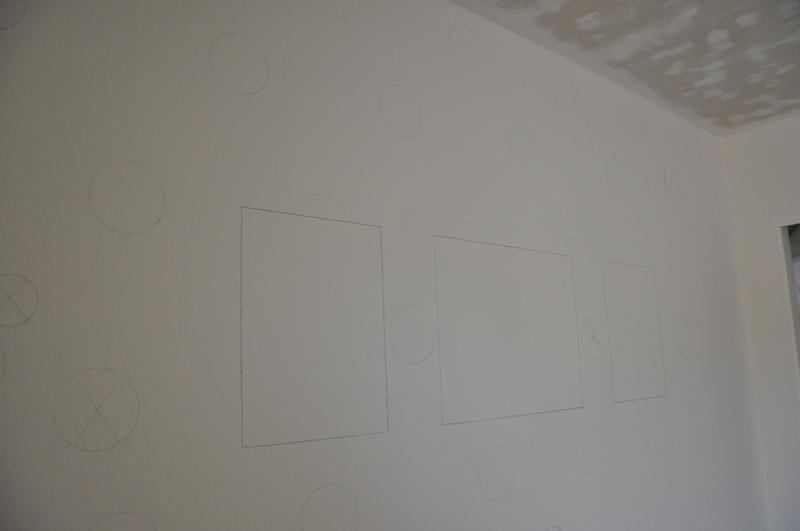 Before we painted the wall, Mrs. Dreamer drew in what we planned to go on here – a few frames and then the dots. 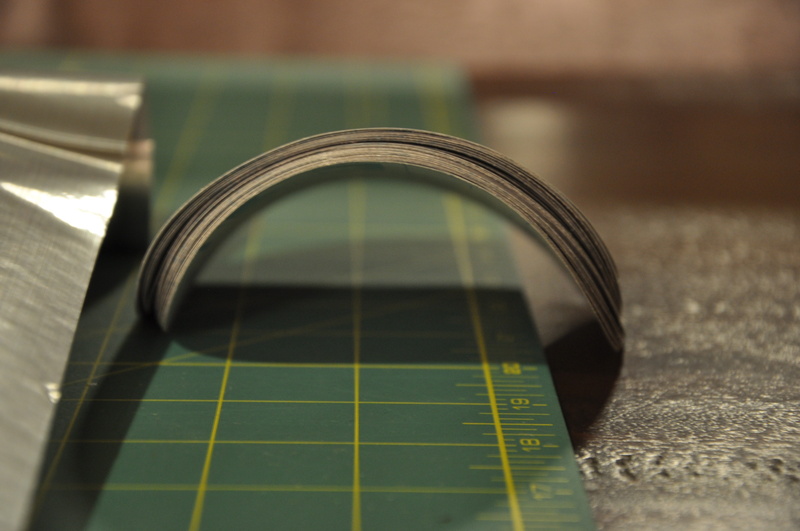 We settled on the 5-inch size (about the size of a CD) and the spacing we liked. 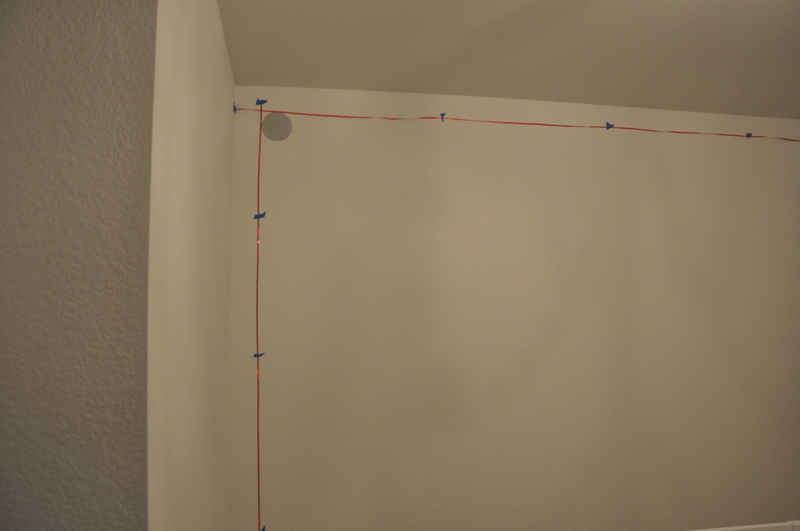 With that, we calculated we would need 60 dots per wall – and were initially leaning towards putting the dots up on two walls. So, that = 120 dots. We contacted a reputable wall decal company for a quote. With a 20 percent discount and shipping, 120 5-inch dots = $220. And by “we” we mean Mrs. Dreamer, solo. The Mr. was off painting something and shoo’d the baby-bearer out of the room. This part is super-easy and goes really fast! 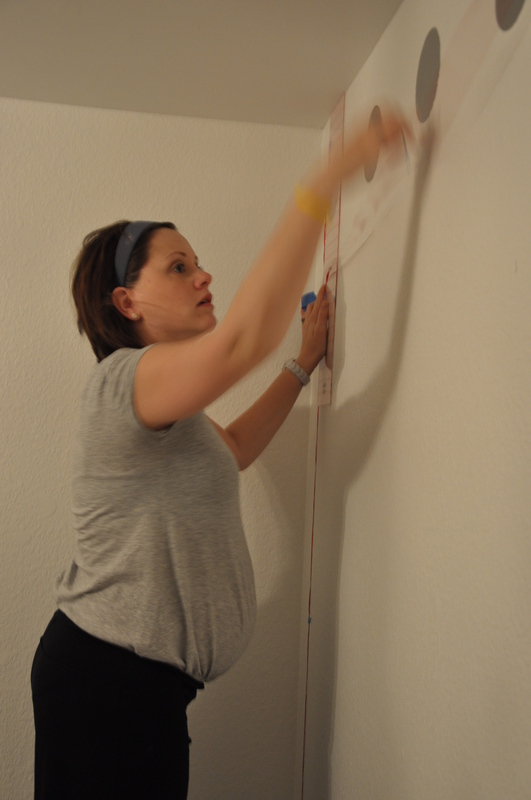 Okay, so now we have our dots – the next challenge: getting them on the wall. When you have Type-A tendencies like one of the Dreamers (the Mrs.), this ends up a daunting task. 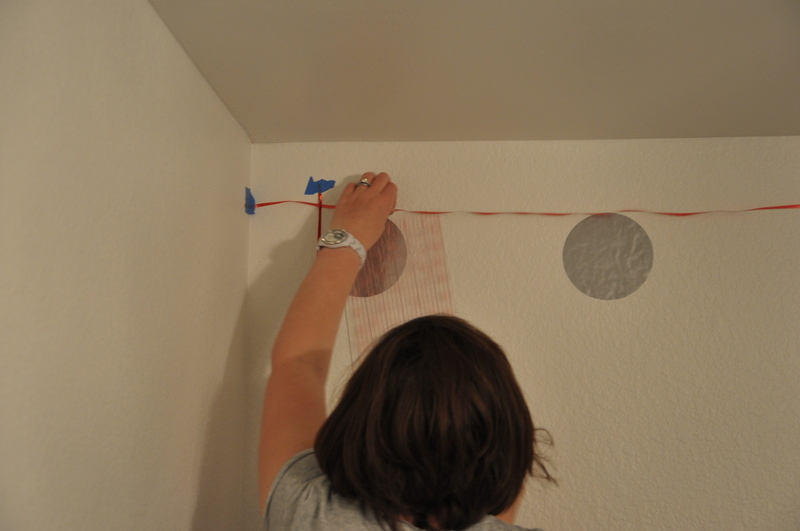 We did not want the dots haphazardly thrown up on the wall. If that’s your thing – this process would go a lot faster! 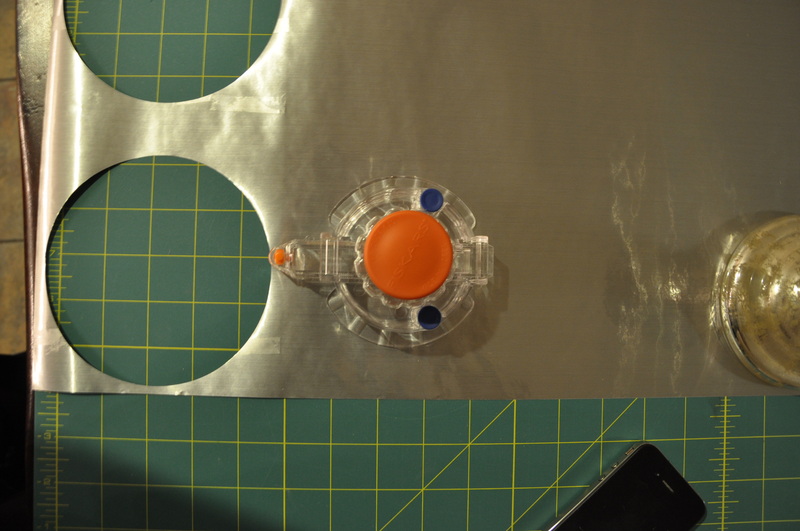 But if you’re like us, and want those dots in straight lines – some prep work is in order. In the end, we had seven perfectly aligned rows, perfect symmetry and a happy momma-to-be (at least ONE of her ideas panned out!). TOTAL = $39.96 (that’s a $180.04 savings from the pro’s quote!!!) Connect the dots… we’re two happy baby-parents-to-be! AWESOME, Meesh! You are so creative; it looks amazing! Very sophisticated! Fabulous tutorial! And, I love how it looks in the room. Way to come up with a cheaper solution!! 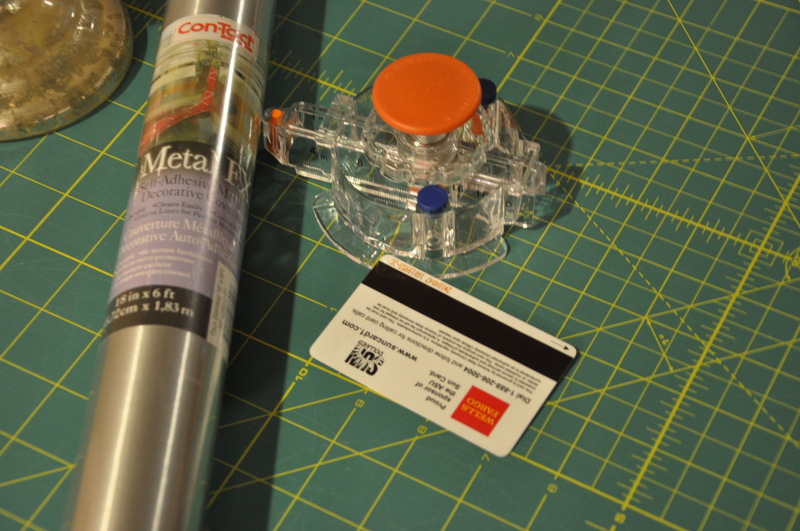 And, a circle cutter… who knew! I love this soooooo much! And the colour is fantastic as well. Any idea on how easy it would be to remove the dots from the wall later? what are your wall dimensions? Good question… I had to go measure. 8×10. 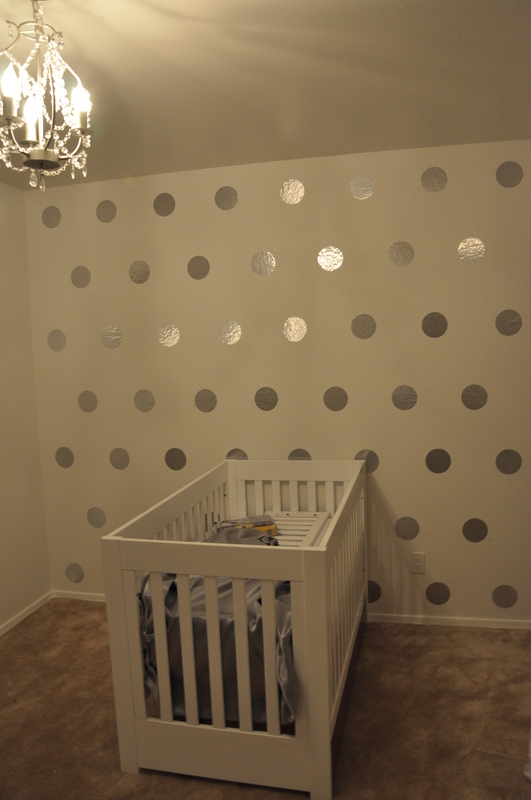 i love the silver dots, how did you glue them to the walll? 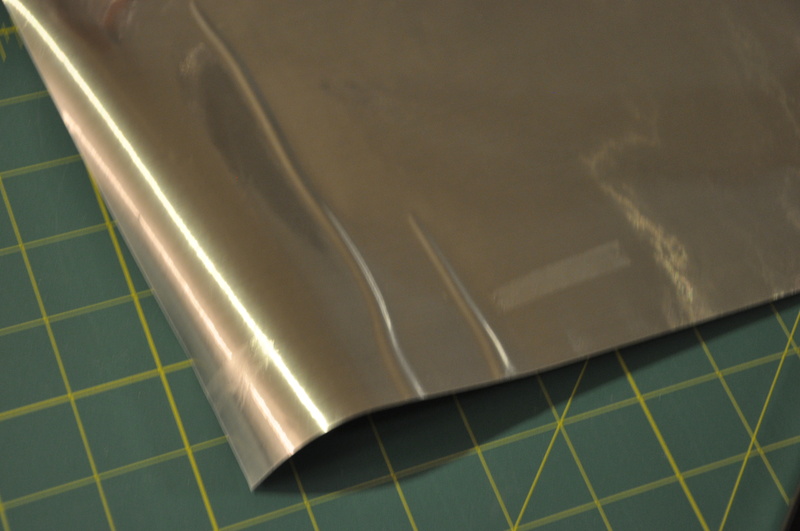 Ana, they are cut from contact paper, which is sticky on one side. So easy!! This is amazing. I found your nursery on projectnursery.com. I love that you did a tutorial for everything because I want to copy this room exactly for my little girl! You rock. We have textured walls as well!!! 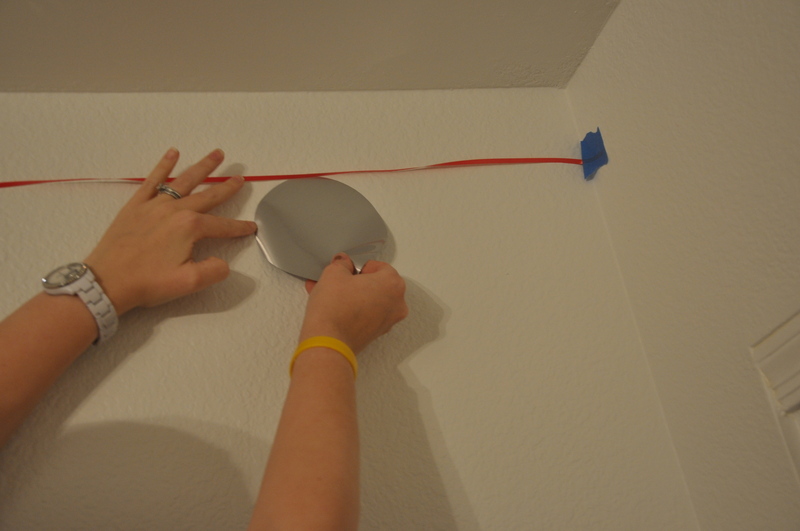 We have tried to put up wall decals in the past, and they begin peeling within a month or two. 🙁 These look awesome! I’m definitely going to try this!!! Hello! So beautiful and chiq! Im looking forward in doing the same soon. To complete the look, where did u get the curtains and valence? Not valence.. I meant.. cornice! Tnks! 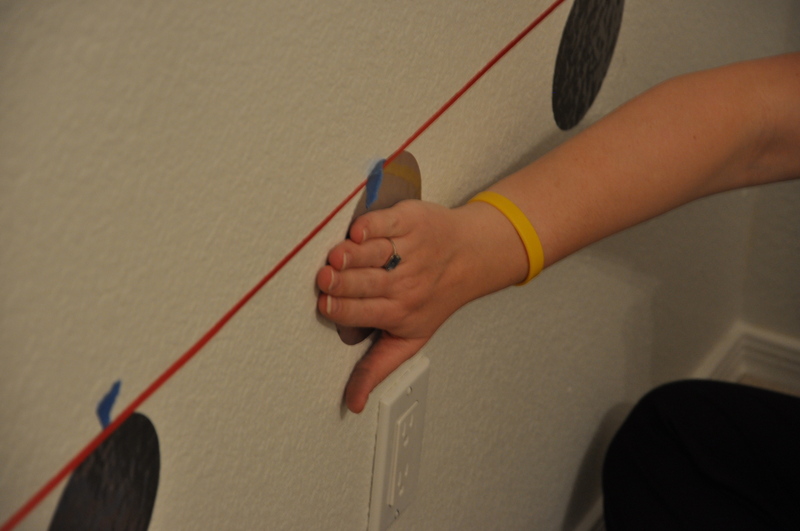 will the contact paper come off the wall easily when you are ready to change the room? Yes! I’ve already had to take one off to hang something on the wall and it just peels right off with no problem at all. It doesn’t even take any paint with it! Thanks for the awesome idea! We are going to do this same thing in our nursery! Exciting, Kelly! Please post a link with photos!